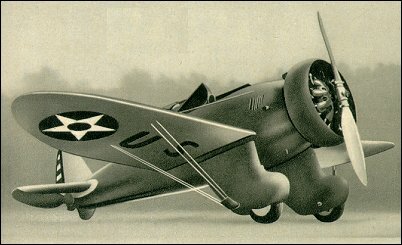 The P-26 Peashooter was Boeing's first and last production monoplane fighter. Some 111 P-26A, 2 P-26B and 23 P-26C were built for the USAAC. The type had monoplane wings, the outer panels of which were externally braced with front and rear wires. The centre-section spars were constructed of steel with ribs and skin covering of aluminium alloy. Split-type trailing-edge flaps were later added to P-26A and were manually operated from the open cockpit. The semi-monocoque fuselage was also of aluminium alloy construction. A fixed, heavily trousered landing gear was fitted and power was provided by a 447kW Pratt & Whitney R-1340-27 or -33 radial engine. Armament comprised two forward-firing machine-guns of 7.62mm and/or 12.7mm calibre and two 55kg or five 15kg bombs could be carried. Although never used in action by the USAAC, ex-Army P-26 acquired by the Philippine Air Force fought the Japanese during World War II and the 11 Model 281 export fighters for China must also have seen action against Japanese forces. In addition Panama and Guatamala received ex-USAAC P-26 and Spain received an export model. A "Pea Shooter" was recently added to the Seattle Museum of Flights Great Gallery. Reason for the Peashooter tag ? We went to the Cleveland Air Show when I was about 6 or 7(1936?) and I saw some lined up and never forgot them. I remember an air show at Bishop airport in Flint MI. in 1933. There were six there from Selfridge Airbase in Mt. Clemens MI. near Detroit. They had trouble starting one of the planes, had to wind a very long rope with a sock over the prop to start it. They normally had a large shot gun like shell fired to turn the engine over and mag start. The P-26 Peashooter is one of the first monoplanes in the world. Lightweight and easy to fly, it remained in service for many years until the United States entered the war. version that does have later added flaps and tail wheal. We have been at it for over 10 years. We are building it to Boeing plans just like the did in the early 1930s. Boeing sold them to the Army for $9999. Come down to the basement and see how much we have done. I was a Major Engineer w/Boeing in Seattle during WWII and looking thru the photo books on the P-26 I seem to remember seeing photo's of two (2) 50 cal. forward firing machineguns. The P-26 that the Military Aviation Museum in Virginia Beach, Va.(militaryaviationmuseum.org) has is a replica built by volunteers at Nate Mayo's "Mayocraft". I understand it had about 20hrs. on it before the museum bought it last summer, and is said to fly very well. You can "Yahoo" Mayocraft and watch several You Tube Mayocraft P-26 videos covering construction start to flights. The Military Aviation Museum here in Virginia Beach VA recently acquired a Peashooter in restored condition - it really flys - the aviator has to be pretty skinny to fit inside the cockpit. A beautiful classic aircraft. These may have been the first fighters with fuel injection, made by ExCello. Bar none, the most awesome looking airplane ever built. Art deco meets aerobatic blood. The example at Wright Pat is phenominal. From pure performance stats, it is certainly lagging the big muscle of later generation fighters, but I'd rather watch one perform at an airshow than an F15. I wish somebody would build a replica to fly on the circut.